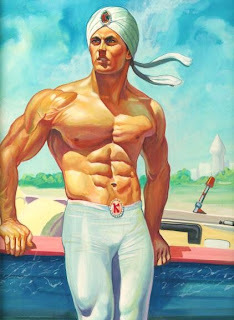 Created in 1963 for a Mexican radio play by Rafael Cutberto Navarro and Modesto Vázquez González, the mysterious hero known as Kaliman was an instant hit with audiences across Latin America. With his sworn oath to the goddess Kali to fight injustice around the world, he travels with his side-kick, Solin, an Egyptian boy who is descended from the Pharaohs. A master of the martial arts, Kaliman also has extensive mental powers including telepathy, levitation, remote viewing, telekinesis, hypnosis, astral projection, self-healing and his "actus mortis" state to fake death, just to name a few. A hero that never kills, Kaliman is a human at the peak of his abilities, thanks to his superior esoteric knowledge, but often states that all mankind could have these talents with great study and dedication. His wise phrases are legendary to fans as he guides young Solin along his own path. Sayings like,"The mind's eye sees further" and "He who brings peace opens any door" or "Life ends and begins with a vision of hope" are some of many. Kaliman's first Mexican comic appearance was in December of 1965 with a ten part storyline entitled "The Tomb Raiders" which sold out its 100,000 copies in just one week. The original series lasted for twelve hundred exciting issues loaded with action and adventure before the title finally ended in 1991. Reprints of Kaliman have been published in Latin America since 1998. Great post! It's very seldom that I see Kaliman mentioned in an English language webpage. He was indeed very popular from the 60's to the late 80's. There were even two movies made in the 70's with the american Jeff Cooper in the role of Kaliman. 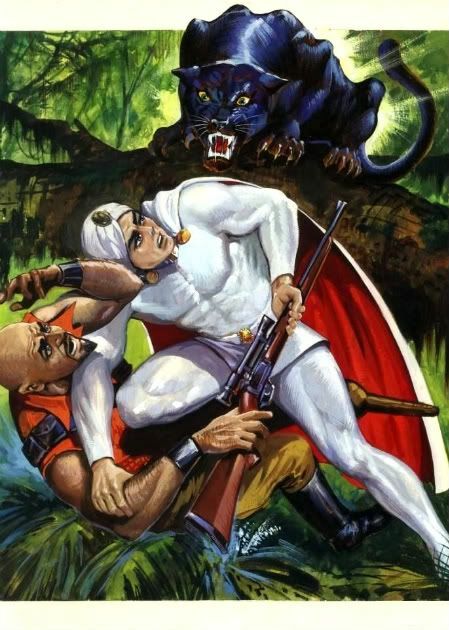 It's very curious that one of the most popular Mexican comic characters is not even Mexican since Kaliman's stories were set in India or some undefined Eastern country. There are so many great comic characters from around the world, one could post forever. Do you know how could I get original Kaliman comic book art? Gutierrez covers were legendary and the sepia interiors were awesome. Unfortunately, I don't know where you can find any of the original art for the series.